EDORH Akpé Kévin Sénu was born on February 29, 1996 in Lomé, Togo. In 2012, he obtained his Professional License in Application Development. 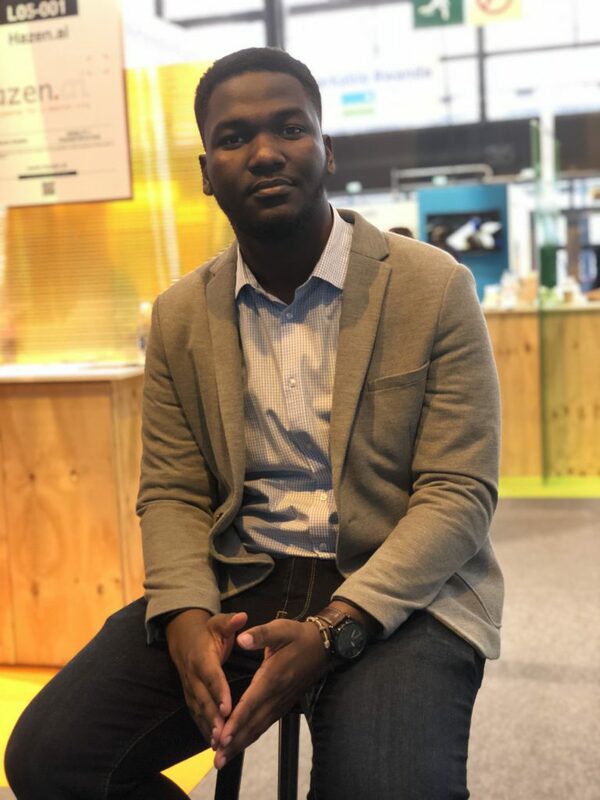 He created in 2015 with three other colleagues from the University: ATIKLEME Eddie Michel (Systems Administrator), YAWOVI Agbéwonou Helton (Applications Developer) and YAWOVI Agbéwonou Darwin (Lawyer) Dashmake. The creation of “SOS System” came from a simple observation. For example, in a traffic accident, paramedics arrive late. And often even too late to save lives. Hence the desire of these young people to create a platform linking relief and people in need of help. At Dashmake, this young men are convinced of the high importance of each and every single life. Every person that dies is an important loss for the togolese national economy, therefore they want to contribute to the preservation of life in case of severe road accidents, diseases crisis or fire. In addition to providing an effective and efficient claims management system, SOS SYSTEM delivers daily wellness and security advice to it’s users, with the possibility of earning communication airtime or internet package by sharing them with relatives and friends. Frequent internet connection issues experienced in our country and the lack of sufficient and adequate materials for the national firefighters company with which we are currently in partnership. This last aspect limits a lot in deployment of our solution at its full operating potential. Obtaining finance and especially getting partnerships in order to deploy our solution in other countries of Africa and the world are areas we are still tackling. It tackles a problem that is very rarely or partially addressed by technological innovations in africa. We offer an easily duplicable solution in any context in the world. 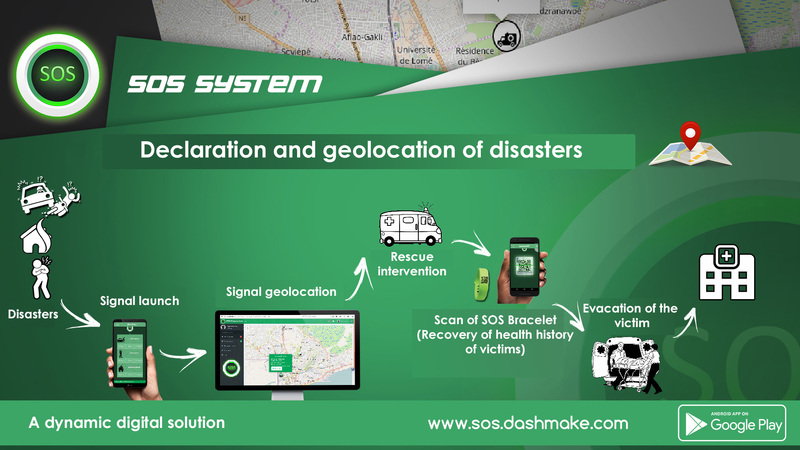 It is composed of: SOS Mobile (mobile app for launching distress signals); SOS Supervisor (web application for management and geolocation of people in distress); SOS ADS (web application for sending health tips); SOS Bracelet (a gadget in the form of a bracelet equipped with a QR code to preserve the health history of any person who acquires it). We are currently in partnership with the national fire brigade of Togo and a private company of ambulances which together, thanks to our system, treat a hundred of sinisters per day. Our mobile application is constantly evolving to take into account new realities on the ground and our publications on social networks; reaches nearly 250,000 people are. The first lesson learnt is perseverance in face of difficulties because when the situation seems difficult, we manage to overcome it through perseverance. Then we have to learn to surround ourselves with a good team, the team is very crucial for the success of the startup. The vision is also important, it must be maintained and be shared. Finally, it is important to trust in yourself and in God. We want an Africa that…. An Africa at the forefront and independent in terms of technology, with solutions developed locally by Africans and for Africans, taking into account the realities of the continent and the aspect of sustainability. In the long term, an Africa exporting new technologies to other continents. SHARE IT WITH THE WORLD TO SHOW YOUR SUPPORT!